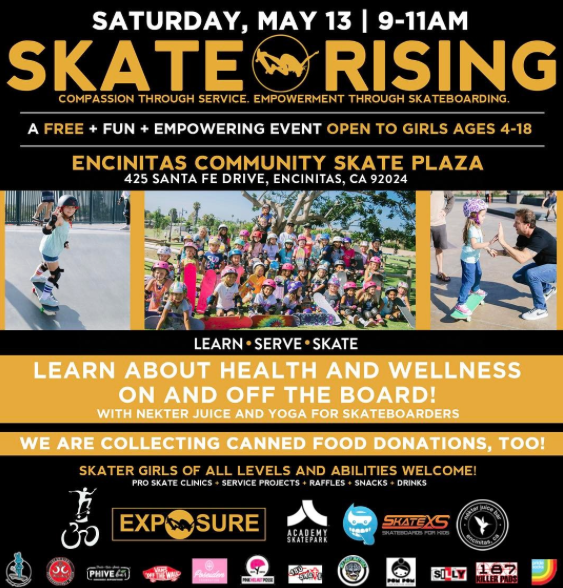 On May 13th, Skate Rising is returning to the Encinitas Community Skate Plaza. In addition to skateboarding the girls will learn about health and wellness on and off the board from Nekter Juice & Yoga for Skateboarders. I caught up with my friend Bridget, who I met through EXPOSURE Skate, to find out the scoop on Yoga for Skateboarders. Bridget runs the yoga clinics at EXPOSURE Skate and for the 5th anniversary last year she held an EXPOSURE Skate Yoga Challenge. 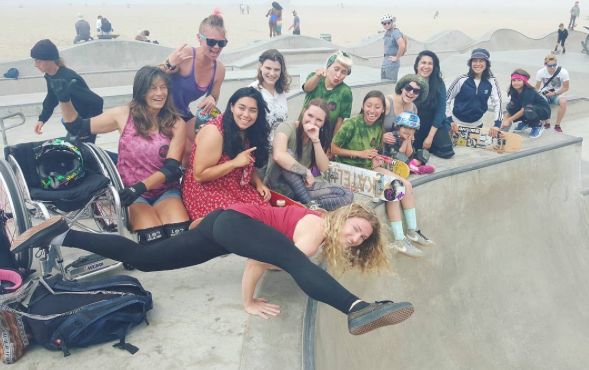 She’s also active with LA Girls Skate Sesh where she held a workshop on April 2nd. How & when did Yoga for Skateboarders start? Bridget: Yoga for Skateboarders happened entirely as a result of my environment. I grew up in Venice | Santa Monica, and I can’t recall a time in my childhood where I didn’t know what yoga or skateboarding was. They were present in my daily life. It wasn’t until more recently, after I became certified, that the connection happened on a deeper level. I wanted to share that feeling with all of my friends. I had just received my first yoga certification in 2010, right after the Venice Skatepark opened. I wasn’t confident enough as an instructor to waltz into a yoga studio just yet, so whenever I was at the skatepark with my friends, I would practice teaching them, as a way to hone my skills as a new instructor. Soon i realized skateboarders make the absolute best yoga students! I learned so much just from teaching friends with different kinds of injuries, conditions, etc. Eventually we would gather near the graffiti walls for class then venture to the park to session. It started to become a regular thing and the name “Yoga for Skateboarders” stuck. Now I’ve been teaching yoga for skateboarders for 7 years and it is my favorite thing to do. Why do you think yoga helps skateboarders? 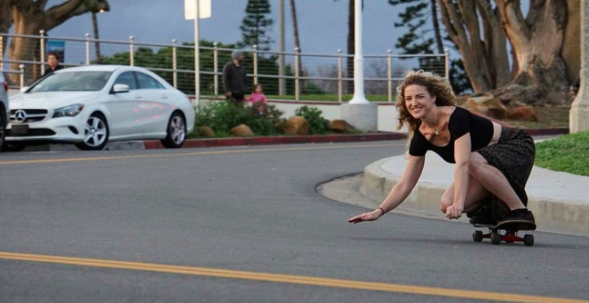 Bridget: For me, yoga has a very synergistic relationship with skateboarding. They have been crucial in the way I view life. Yoga has taught me how to be aware of my fears, skateboarding taught me how to face them. Every skateboarder, athlete or human can benefit from a yoga practice. If you love skateboarding, you’re already halfway there! It has more in common with yoga than you might think. They both are more than a sport, like a form of individual self expression, they require you to be in the present moment, they teach you balance and you can practice both of them on your own or with a group of friends. If you think of your body like a vehicle, then yoga is the process that keeps your vehicle running well and performing it’s best. Like changing the oil or rotating the tires. The poses we do in yoga are used to check in with yourself. The pose will tell you a story about your own body; what may feel tight, what may feel sore, etc. Utilizing yoga as a tool in this way allows us to treat our bodies the way we should. Like our own best friends! Namaskate. Thanks Bridget – can’t wait till Skate Rising on May 13th to see you! To find out more about Skate Rising, EXPOSURE Skate’s youth program, follow them on IG or contact the organizer, Calli Kelsay at calli@exposureskate.org. If you’re in the San Diego area, hope to see you next week May 13th for Skate Rising with Yoga for Skateboarders.